This September the award winning novelist and poet, Jo Mazelis is beginning a new Reading Round group at Galerie Simpson on Swansea’s High Street. A reading round is a little like a book club except that the text is read during the session and the group are invited to respond to it while it is still fresh in the mind. For this reason it is short stories and poetry which will be enjoyed and discussed. This will include a wide variety of work by writers that may include Edna O’Brien, Sharon Olds, Simon Armitage, Jhumpa Lahiri, Raymond Carver, Ted Hughes and Ali Smith. The chief aim of the group is to explore the rich landscape of literature we have available and to enjoy and discuss it in a warm and friendly atmosphere. No previous qualifications are necessary to join the group, the only requirement is a love of reading, pure and simple. This is not a creative writing class, nor an English Literature or English Language class. Instead it is an opportunity to listen to carefully chosen short stories, essays and poems, and then respond to them in a series of relaxed meetings over the course of a year. So what can be expected in a typical Reading Round session? Each meeting will take about two hours, during the first half Jo Mazelis will read aloud a story while the group members either simply relax and listen, or if they wish, they can read along silently with a printed version of the work. The story will take between ten and fifteen minutes to read. The group will then discuss it. The discussion that follows will be based purely on the work itself, no prior knowledge of the author or the work is needed and as stated before, there is no right or wrong response. After this there will usually be a short break for coffee then the second half of the meeting will begin with the reading of a poem and once more the group will discuss it, sometimes reading or hearing it for a second time. All of the reading round sessions are FREE apart from a small charge for tea or coffee. There will be a total of thirty meetings over the course of a year which it is hoped will be attended regularly by all the participants. These schemes which are organised by the Royal Literary Fund have been run very successfully in other parts of the UK but this is the first opportu-nity for people in Wales to take part. There are limited places so booking is essential. It is thought that the sessions will be held weekly on a mid-week afternoon or early evening. Please email Jo Mazelis at jomazelis3@gmail.com or write to: Jo Mazelis, care of The Reading Round, Galerie Simpson, 222 High St, Swansea SA1 1NW giving your telephone number and other details if you wish to enrol in this group. Screwdriver, drill, saw, chisel, hammer, DIY, computer. If these give you a sense of excitement or even dread then there is now a place for you to go. 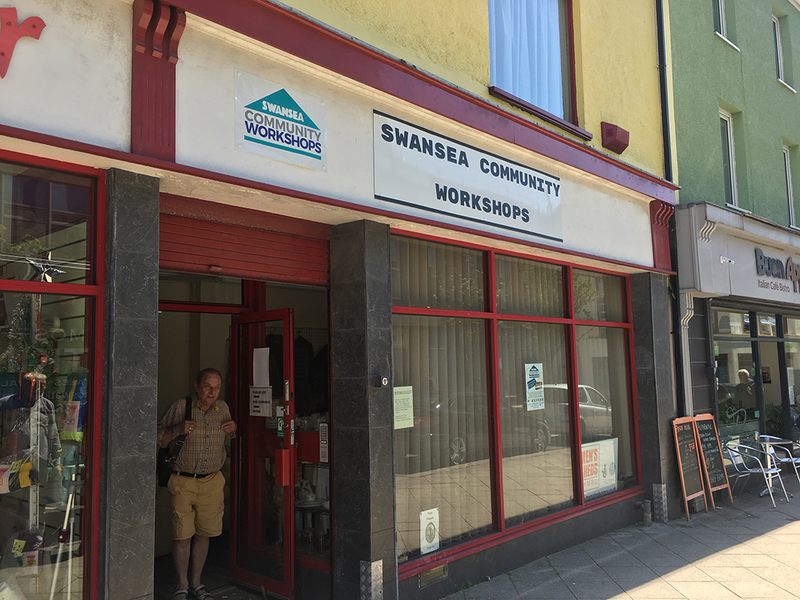 Swansea Community Workshops, at 208 High Street, Swansea has been set up as a place for people 50+ to meet, chat and engage in activities. The Workshop is a larger version of the typical garden shed – a place where people can feel at home and pursue practical interests at their own pace. It’s a friendly, warm and welcoming place that is easy to find and easy for everyone to access including people in wheelchairs. More than this, members can share the tools and resources they need to work on projects of their own choosing, or pick up one of the many suggestions that are available. It is a place of skill-sharing and informal learning, of individual pursuits and community pro-jects, of purpose, achievement and social interaction. Equally, if you do not wish to do anything you are very welcome to just go in and have a cuppa and a chat. At present the Workshop is in its infancy, which means those joining have the chance to influence what is on offer and how it develops but that has not stopped individuals pursuing their own projects. At present one person is building a puppet theatre, whilst others have been carving an elephant and building garden planters from old pallets. In addition to the woodwork, there is also the opportunity to develop computer skills for the complete novice to the more experienced user as they have a computer suite but with a difference. Their system uses Linux rather than Windows; Linux is cheaper, safer and more accessible for many people. If you can afford it there is an annual fee of £60 for members and people are asked for a £2 voluntary donation each session they attend. Swansea Community Workshops is a registered charity, so those on low incomes will not be expected to pay anything as it is felt more important for people to have the benefits from attending. They would, how-ever, like members to make articles that can be sold and this would generate income for the Workshop, so we might not have to charge a fee in the future. The Workshop is currently open for four sessions a week, Monday, Tuesday, Wednesday and Thursday from 1pm to 4.30pm. Other sessions will be added in due course and can be negotiated. Here’s a scene (right) that was repeated countless times across our city this month almost 50 years ago. For it’s almost half a century back that flags and bunting filled our streets in celebration of the Investiture of Prince Charles as Prince of Wales. The year was 1969 and though the Investiture was held in Caernarvon Castle the parties filled the streets everywhere else including Margaret Street, St Thomas where this one was held. 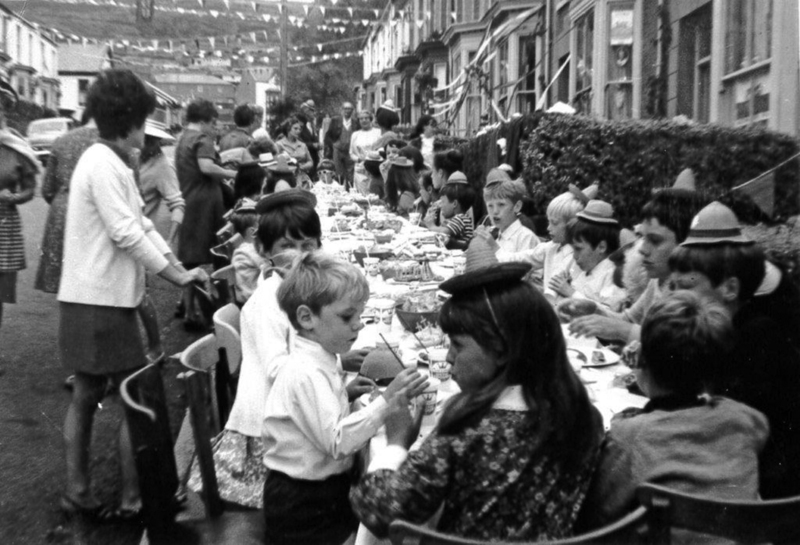 The grown-ups found plenty of flags and bunting to colour the street as well as filling the table with a feast fit for Royalty itself. This lovely photographic reminder is drawn from Swansea Revisited the latest and 19th book from former city journalist and publisher David Roberts. The book captures some fantastic glimpses of Swansea in the past. For details on how to buy a copy visit www.bryngoldbooks.com or phone 01639 643961. This year Uplands Arts, Swansea’s own Gilbert & Sullivan society, is celebrating two notable anniversaries. It’s the 75th year since the society was formed specifically to perform the G&S operettas in the city, and this year marks the 30th anniversary of a partner-ship with the Taliesin Theatre, where members and audiences have found a happy and welcoming home. This year’s show is “The Sorcerer”, a tuneful and hilarious exploration of what can go wrong when a young man with the best of intentions tries to inter-fere in the course of true love.